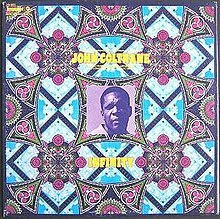 Infinity is an album credited to John Coltrane, released on Impulse! Records in 1972. It features overdubs with strings of Coltrane's pieces recorded in 1965 and 1966, at the hands of Alice Coltrane. Her controversial "re-imagining" of her husband's late works was criticised by both fans and critics, as she took his original performances and superimposed them over lush orchestral backgrounds and re-dubbed rhythm section parts, as well as recording new solos on piano, organ, harp and timpani. Tracks 2 and 3 were originally recorded by the "classic quartet" (John Coltrane, McCoy Tyner, Jimmy Garrison, Elvin Jones) in 1965, while tracks 1 and 4 were recorded by Coltrane's later ensemble (Pharoah Sanders, Alice Coltrane, Garrison, Rashied Ali, and extra percussionist Ray Appleton). On the 1965 tracks, Alice retains the original rhythm section parts, adding string and tamboura parts only, but on the 1966 tracks, Garrison's bass parts are replaced with new recordings by Charlie Haden, and she herself records new solos. Overdubs recorded at The Village Recorder, Los Angeles, California, in 1972. This page was last edited on 7 December 2018, at 04:26 (UTC).